Originally posted over at Cyclelicio.us, this is reposted with his head nod and smile. This is a great looking bike and a perfect commuter. Kona jumped on the urban fixed gear bandwagon back in 2007 with the Paddy Wagon, an unpretentious and servicable steel framed fixed gear bike. 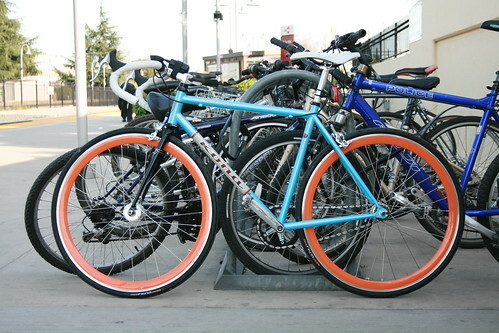 For 2010, Kona blinged up their fixed gear line by introducing the aptly named “Band Wagon.” With orange deep dish rims, a brilliant metallic blue paint job, and a nicely polished look, this bike is a nice attention getter. Bikes are more than the sum of their parts, and Kona has done a good job matching solid, reliable components to the Band Wagon. Alex R600 deep dish rims are bomb proof and stay round and true in spite of the potholed streets of East Palo Alto and single lane roads in the Santa Cruz Mountains. Those rims are mated to Continental’s Ultra Sport 700 – 28 tires, which are infamous for their tight fit. I had no problems squeezing these tires onto the Alex hoops. 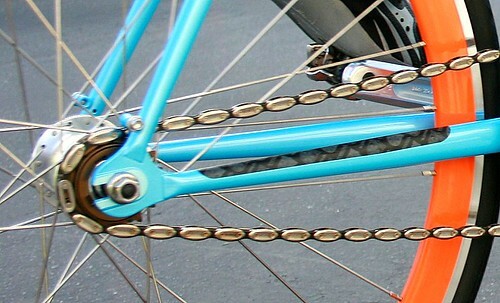 To the surprise of many who equate fixed gear bikes with “brakeless idiots,” the Band Wagon comes equipped with front and rear Shimano R650 dual pivot caliper brakes. Brakes means brake levers, which leads to my only real complaint about the Band Wagon: those silly track bars with brake hoods, which I’ve griped about previously. Kona has their own in-house fixed aficionados, and they consulted other fixie fanatics for their opinions and confirmed handlebar choice really is a matter of opinion. The cutest detail: Kona’s selection of Shimano’s “Coasting” chain, with their obviously distinctive side plates. Believe it or not, people notice that detail. “Wow, where can I get a chain like that?” they ask. The “Band Wagon” is clearly not a track bike, but if you’re not accustomed to stiff bikes with -head down’ aero posture, the Band Wagon may take some getting used to for you. The CroMo frame has a slightly aggressive road geometry that’s good for urban road use. I’ve been on stiffer bikes and I’ve been on more comfortable bikes. The bottom bracket is sufficiently stiff that I don’t feel as if I’m wasting effort with out of the saddle sprinting. I’ve gone on rides up to 50 miles with the Band Wagon through varying terrain and road conditions. After 500 miles of riding the Band Wagon through all weather, even the white handlebar tape remains almost unflawed. 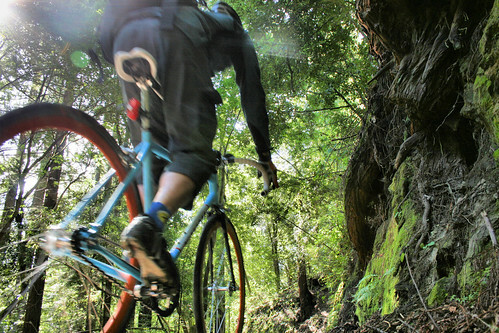 There are a lot of bike nerds where I ride in Silicon Valley and Santa Cruz. Young men, women and Mormon missionaries with deep dish rims and custom builds are a dime a dozen, and the Band Wagon is the bike that any poser with a wad of cash can buy. Still, the Band Wagon has that one-of-a-kind vibe – besides the polished metal bits, seatpost detailing and the marvelously orange rims, no powder coat shop will match Kona’s wonderful metallic blue enamel. Kona’s frame decal application is top notch – not a wrinkle or flaw in sight. Maybe the people I run into are less cynical and more enthusiastic about bikes than some New Yorkers you might know;the SJ Fixed kids I know nod their heads in approval at this middle aged man with the shiny bike. Thirty-something women signal their very clear approval when they see me on this pretty bike. “Ooh, Rich, I really like your bicycle!” they tell me. Grumpy middle aged men in their gray suits vaguely harumph when they see the single cog, but then nod approvingly when they note the brakes before they move on to gripe about those crazy hipsters who run red lights. Fender / rack mounts front and back, and Kona tells me there’s enough clearance under the brakes to mount fenders / mudguards (I haven’t tested this). Two bottle cage mounts inside the front triangle. A mini chainguard covers the chainring, which helps prevent pant cuff mishaps but doesn’t completely eliminate grease stains. Flip flop hub with 16T cogs on both sides. 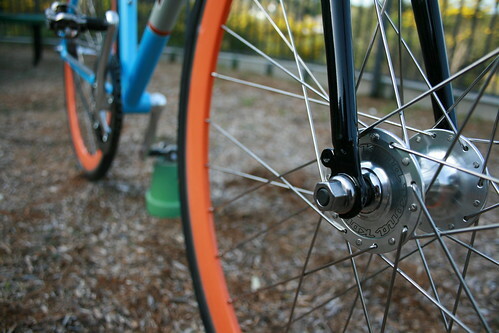 That means you can freewheel on e side, or ride fixed (with no freewheeling) on the opposite side. (I mostly rode fixed in my testing). 42 x 16 = 70 gear inches and 8 skid patches. The Conti Ultra Sport is too sticky to skid well, though after some break-in it will skid to some degree. I tested with 175 mm crank arm; smaller frames sizes ship with 170mm cranks. If you don’t normally run deep rims, watch out for crosswinds. I nearly ate it while riding no handed and operating a camera when a stiff breeze blew across and literally turned my front wheel sideways. Kona’s Band Wagon is a great looking and solidly built bike with a good component selection that will last for thousands of miles. It’s a standout in more ways than one. If you have the cash (a little over $1000 MSRP), and want something besides a power coated conversion or the basic black or beige, the Band Wagon makes a great street bike. Detailed specs at Konaworld.com. Find dealers in Kona’s Dealer Locator.